I need to know more about some oversized vases or jars I have in my possession. 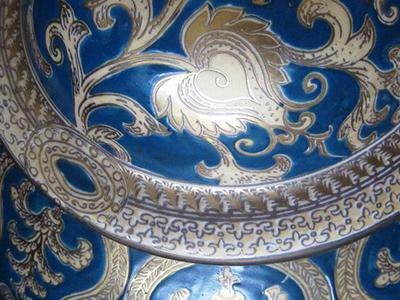 I see lots of junk, over-painted, sloppily painted, outside-the-lines painted pieces of “Chinese” or Chinese-looking pottery or porcelain. I was looking at a piece one day with a fellow browser and he said “It stinks of Macau.” Then he added some other negative descriptions of the work mass produced and sent to America from that part of the world. I keep trying to find “the piece,” or at least a good piece from China. I’ve been paying for my education piece by piece, but that’s OK. Best way for us to learn, isn’t it? How exciting it would be if these pieces turn out to be winners. 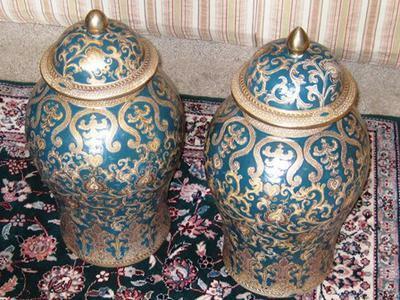 I decided to purchase these two giant ginger jars, (for $49 apiece) presumably Chinese, with a red painted square, rounded edges hallmark on the bottom of each. I know authentic pieces are also marked in red with hallmarks framed in this way. The inside of each jar is unglazed. The inside of the lid has a punctured hole, likely so it would fire properly and not explode in the kiln. They are hand painted with green and gold and some nice detail--not like the sloppy Macau or other cheap Chinese/faux Chinese work I keep seeing everywhere. Someone spent a long time hand-detailing with some kind of dark teal and gold paint….more than I’ve seen on some cheaper pieces. These jars are about 21 inches tall. I tried searching for the exact match of the hallmark. Some marks are correct and some I can't find an exact match for. The characters begin to read correctly from top to bottom, right to left like Qing or Ming hallmarks but then I'm not sure whether I'm looking at merely slight differences as I hear some hallmarks have on them. Or am I looking at purposeful changes--so that to the untrained eye (mine) it appears "correct," meaning, looks like many other Chinese hallmarks I have seen that correspond to certain dynasties--but are really designed by the maker to 1) fool the buyer but 2) just keep the maker shy of being in trouble with whatever manufacturing/copyright laws they have over there. information I seek. I really don’t want to bring them and other pieces I have to an Asian art dealer who crosses her brows, says she has to research them, goes to her back room to Google it (like I did) and then charges me $200 for a guestimate I could have come up with using the same search engines. No thanks. Ming Dynasty, Quig Chao Dynasty….or what? This is such a good contribution because it is a very common thing - people have a nice looking vase or chinese ginger jar with an asian/oriental red stamp marking and they think - hey is this the one that's going to make me rich?! So here's some guidelines for people to judge their Chinese piece . . .
As I describe on my Chinese pages and Gotheborg displays on his excellent website, this mark says “Da Qing Qianlong Nian Zhi” - which translates as "Great Qing Qianlong Period Make". This is an era within the "Qing Dynasty (1644 to 1912) within which the Emperor Qianlong reigned from 1736-1795. I have only ever seen genuine Qianlong marks which look a lot different to this type of square red stamp mark. 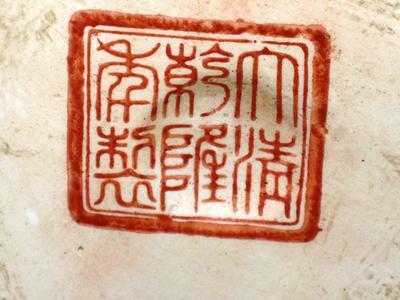 There may be genuine Qianlong marks whihc look like a crude red stamp, but persoanlly I have never seen one. I am not enough of a Chinese expert to say red stamps like yours were never used in the Qianlong era, but it's just the ones I have seen have been different. 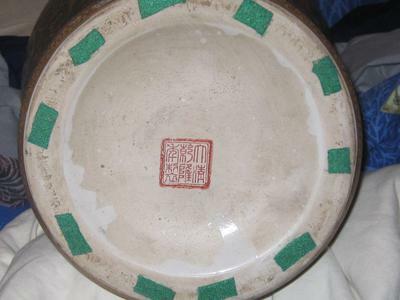 So here is an example of a real Qianlong mark. It is hand written and very finely done by a specialist who clearly did these marks for a living and had to be good at it otherwise who knows what the might have been the punishment!? This photo compares your jar painting style with that of an item genuinely of the era (this was a pair of ginger jars, genuinely Qianlong (1736-1795) sold for $30,000 USD in 2012. Note how the detail is just much more finely painted - without even a hint of 'mass-production'. Note also the style of carefully hand written qianlong marking - not a rough old red stamp. We could still do with more sites like that and this one :) Beautiful vase btw.